..... I've made when I tossed my knitting project into a bag. ﻿I haven't knitted in more than a week because of all the things that needed to be done for my move. I tossed my Paul Smith Cardigan into my knitting bag, not being terribly careful. I should have been. 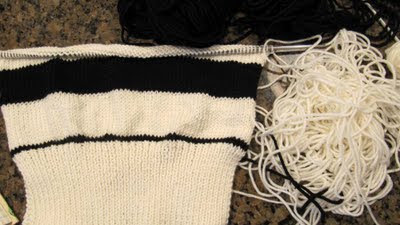 Now, I finally have time to knit but two of the balls of yarn (white and black) are totally tangled so knitting is further delayed. As for the move, things are coming along nicely and I expect that I'll be able to knit more often from now on. Yay! We've all done it. So glad you'll have more time to knit. I'm hoping to get to that point someday myself.